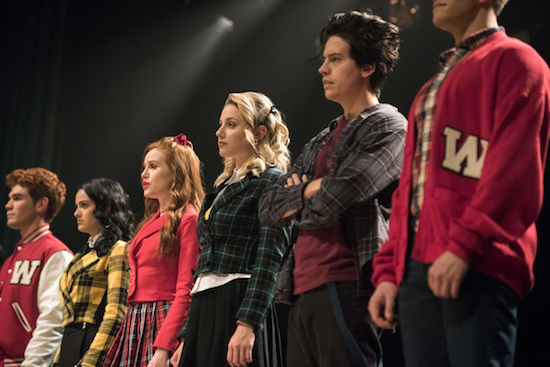 Riverdale — “Chapter Fifty-One: BIG FUN” — Image Number: RVD316d_0381b.jpg — Pictured (L-R): KJ Apa as Archie, Camila Mendes as Veronica, Madelaine Petsch as Cheryl, Lili Reinhart as Betty, Cole Sprouse as Jughead and Casey Cott as KevinÃÂ — Photo: Dean Buscher/The CW — ÃÂ© 2019 The CW Network, LLC. All rights reserved. Let’s talk about Wednesday night’s TV!THE GOLDBERGS: I loved seeing Dan Mintz on the show! I loved Adam making a game about his family, and I imagine a lot of the complaints from his family were things his real family said. (Like the real-life Eric being turned into Erica.) The graphics were fun, but in some way it either felt like a first season episode or one that could have been saved for the eventual final season. RIVERDALE: The episode felt a little less cohesive than the first musical, but it was (big) fun. And Chad Michael Murray’s intro as Edgar—as the twisted cult leader clapped at the end of the performace—was perfectly sinister. WHISKEY CAVALIER: My God, I love this show?? Lauren Cohan and Scott Foley’s chemistry is electric, and it was really smart to get both an undercover kiss/posing as a married couple out of the way early. Yes, it’s still a baby series (and a baby relationship), but this is a trope I imagine they’ll have to repeat and television audiences have changed. SEAL TEAM: Jason has been adjusting to life as a single parent reasonably well—at least as well as can be expected given the circumstances—so it’ll be interesting to see if he can really handle his daughter leaving to go to college. The mission was fine, but my favorite parts of the episode was the team interacting with each other on the plane.